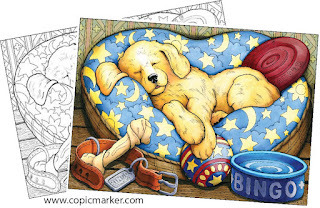 Have you wanted larger images to color with your markers? 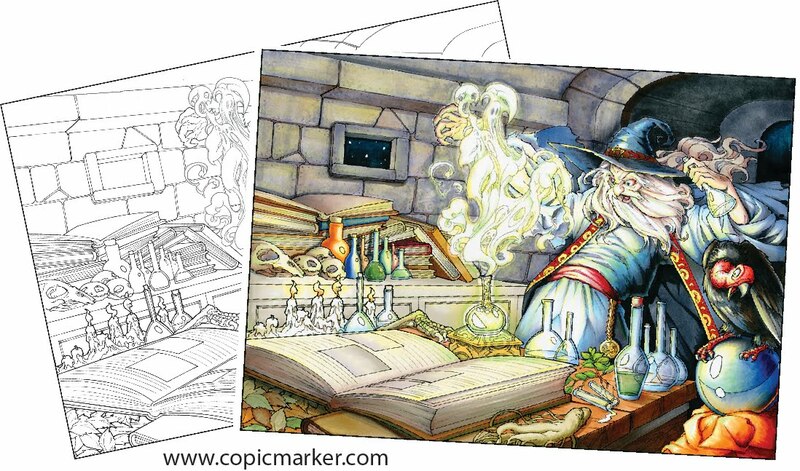 We now sell large-format line art posters printed on high-quality paper, intended for coloring with Copic Markers. 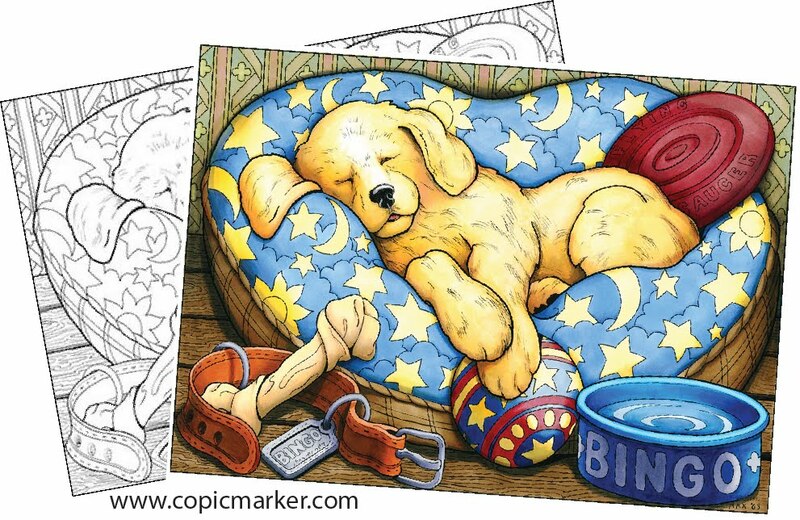 Here is a sample of some of the artwork I colored from this new collection. It was fun to work on something so large. We have some posters that are 10" x 14" and some posters that are up to 22" x 32.5" Wow! That gives you a lot of space to create a beautiful work of art for your home or as a custom gift. These are not paint by numbers, or fuzzy posters, simply high-quality line art posters by assorted artists. Each print is on paper that is intended for use with Copic markers. I really had a lot of fun coloring these giant pictures. Copic markers make the images pop! I particularly liked how complex the wizard image was. I can't tell you how many colors it took to color, but when it was done, it was so worth it! If you are looking for something bigger to color, then I would strongly suggest that you pick up a few of these posters. 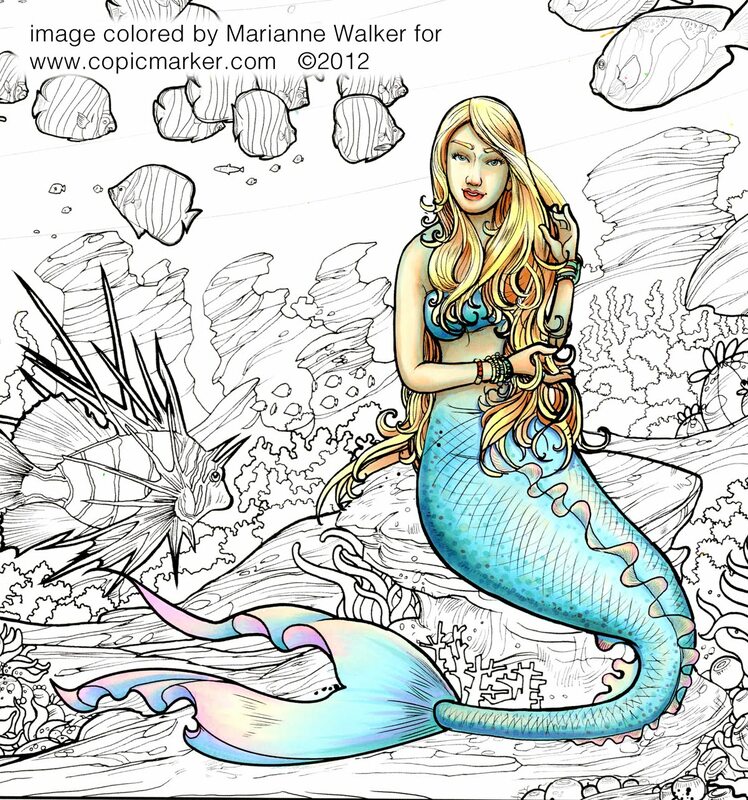 Here is a close-up of an undersea poster that I am in the middle of coloring. It takes a long time to color each poster, but in the end it is really worth it! 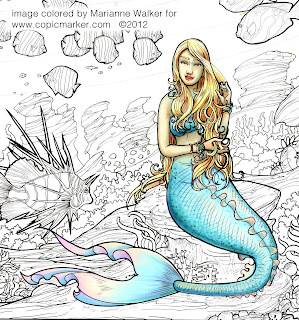 I wanted to add lots of blue to her skin, as this mermaid is underwater, so I colored the skin with E000, YR01, E13, and E15, then added additional shadows to the skin with Boo, to give the hint of blue water. I colored the eyes and lips with BG13, E04, R14 and C3. Her hair is colored with a base of Y11, then I added E42 and E13/E15 for the deepest shadow areas, with a few dots of E04. Her tail is colored with E000 for highlights, then B00, BG13, B12, for the blue areas, with B34 in the shadows. The fringe/fin is colored with E000, RV02, Boo, and BG13. I threw B12 in the deepest shadows on the fringes and fin. I hope you get a chance to order a few of these posters, and have fun tackling them. 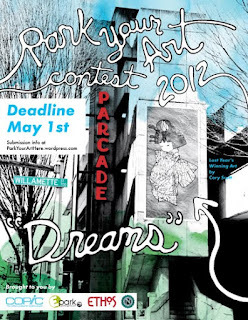 For the second year in a row, Copic is sponsoring an original art contest, Park Your Art. This contest is open to anyone around the world. This year's theme is "Dreams". The chosen winner will get their art proudly displayed very large on the side of a parking structure here in Eugene, OR. The winner will also receive a great prize. Deadline May 1. For more details please visit the Copic blog post about this contest. If you are interested in classes, be aware that classes are filling very fast. Our Dallas class filled in 4hrs! So, don't delay to register. April 19th, Milwaukee, WI taught by Debbie Olson only a couple spots left! May 11th, Kalamazoo, MI taught by Marianne Walker filling fast! May 18th, Minneapolis, MN taught by Debbie Olson filling fast! May 21st, Hanover, MD taught by Lori Craig filling fast! Take your coloring to a new level with these exciting Intermediate Certification classes. You can now take these classes back-to-back with the standard classes. To apply to any of these classes, please visit our website and you will find an overview of the program. May, 19 Minneapolis, MN taught by Debbie Olson almost full! Thank you all for participating in the blog hop this week. I finally got my copy of the Copic Coloring Guide Level 2: Nature. Even though Colleen and I worked so hard on it, and we knew every piece that went into it, it is still so amazing to see how beautifully the book came together! Monday, March 12th, I will be offering classes and demos and a fun open house at Art Tech Supplies in Greensburg, PA.
7 to 9pm will be a drop-in open house/book signing event. This will be my first book signing for the new Copic Coloring Guide, so stop by for a wonderful time with the folks at Art Tech. I hope to see you there! 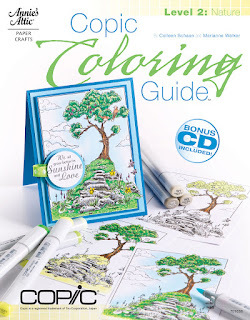 I am so excited to participate this morning in the blog hop for my new book, Copic Coloring Guide, Level 2: Nature! Colleen Schaan and I worked so hard on this book. We wanted each of you to be able to learn as clearly and easily as possible, and we both feel that the step outs, blank images, and gorgeous finished projects will help you see each technique and be able to re-create it for yourself. Annie’s Attic did an amazing job pulling this book together for us. We love how it came out, and we think each of you will love it too. Colleen coordinated a fabulous team of designers to contribute to this project. I made one card project in the book...for those of you who have your copies, see if you can find it (Stamp: Our Craft Lounge)! However, I had the pleasure of drawing ALL the images that we step-by-step color in the book. You'll love how comprehensive and simple we make the coloring. So, would you like to win your very own autographed copy of the book?? Please visit each of the blogs listed below and leave a little love. Each designer will be drawing from the comments on their own blog for the winner of an autographed copy. (Signed by Colleen, myself and that particular designer!) Commenting is open until Friday, March 9th. Winners will be announced on individual blogs. When we go to Comic shows, people are always interested in our most popular skin colors. Today I want to share the chart that we fill out and have at those shows. This is free for your own personal use and not to be sold or used for commercial gain. 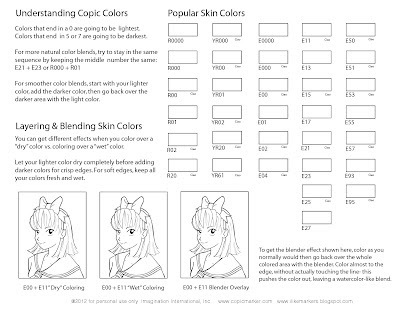 For other color charts provided by Copic, please visit our website. And, don't forget to enter your favorite skin color combo on Thursday's post for a chance to win two rolls of double-sided tape. Welcome to the Copic Family! Congrats!! We are so happy to have these talented ladies sharing their skills with those of you who are craving more wonderful projects and ideas for using Copic Markers. 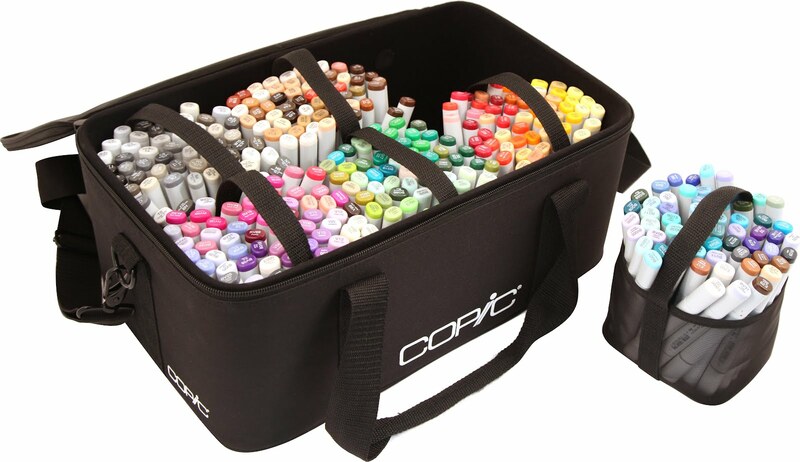 Please visit Cindy & Michele's blogs for a chance to WIN a new Copic Carry Case! Read their blog post, leave a comment, welcome them to the Copic team, and you will be entered to win a case. 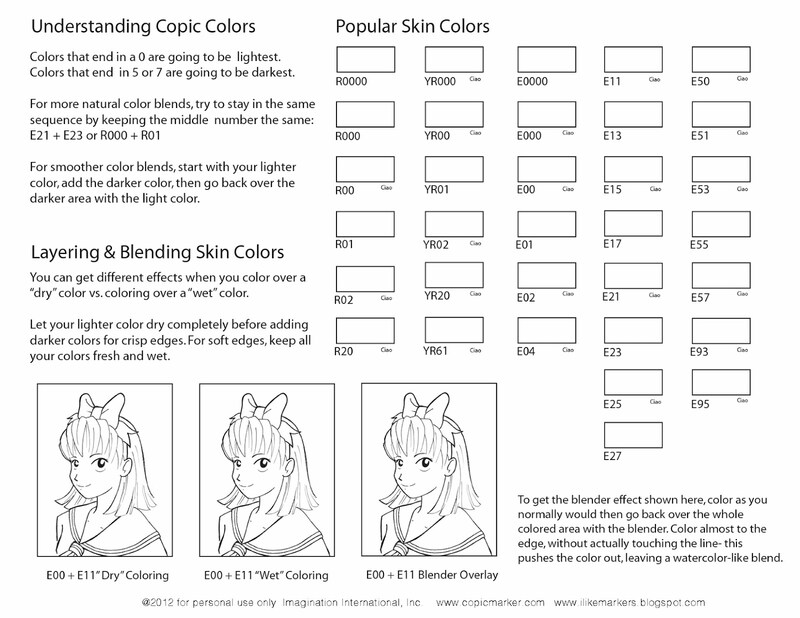 What is your favorite Copic skin color combo? 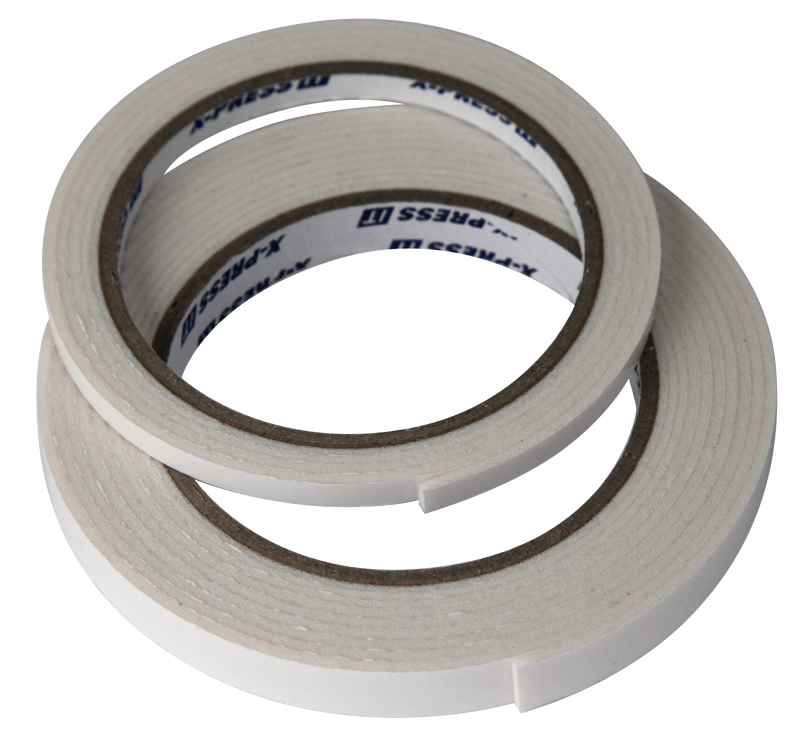 I am giving to THREE lucky winners, two rolls of the popular XPress-It double sided tapes. Each winner will receive one roll of the unique 1/4" foam tape, and one roll of our regular double-side tape. (Contest only open to US and Canada). Please make sure I have a way to reach you, a valid e-mail address or blog site, as it is hard for me to find winners sometimes. To celebrate, this weekend all of our other designers and instructors will also have giveaways, so check them out. Some will be celebrating today, some tomorrow, so check both days. Again, we are really looking forward to working with Michele and Cindy, and we thank you for helping us give them a warm welcome to the team!